Monday November 19th was finally the time for the first MobiGoIn-Action European Matchmaking Event in Paris, where all the selected SMEs that took part of the first phase in the project, the Acceleration Program for USA/Canada, had the opportunity to meet and discuss potential collaborations. During the autumn, 34 companies from France, Sweden, Italy, Germany, Luxembourg, the Netherlands, Spain, Romania and Ireland took part in several workshops and webinars to prepare themselves for their possible international missions to USA and/or Canada. A total of 9 Workshops (both in presence and online) were held to explore strategy development, marketing plans, service providers, cultural barriers, legal and fiscal aspects, smart mobility and automotive trends, business intelligence and a lot more – all of which had a clear focus on the US and Canadian markets. How did we proceed after this? Well, it was finally time to meet one another. 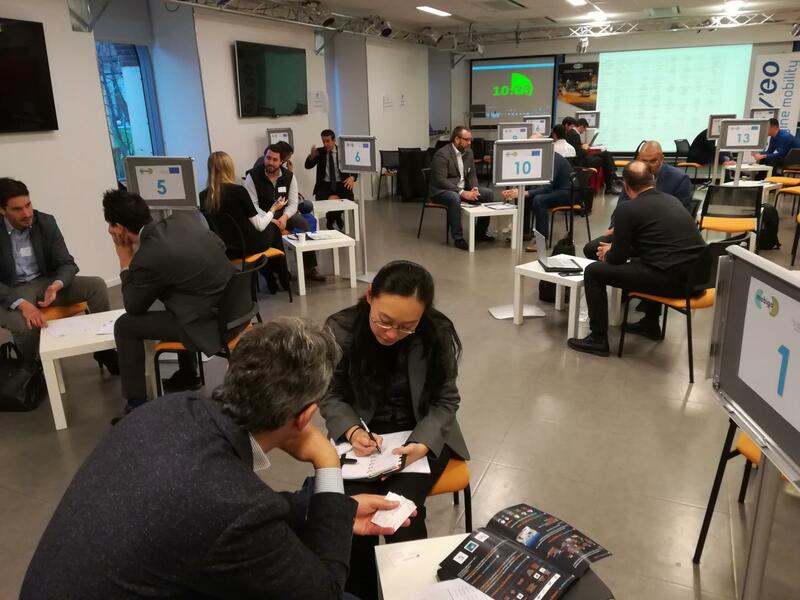 With so many complementary competences and all possibilities to meet face-to-face and to explore future business possibilities, MobiGoIn-Action Consortium arranged a matchmaking event in Paris, leaded by partner Mov’eo, where all the SMEs were invited. 24 companies came through to meet in France for a one-and-a-half day program, consisting in half a day filled with B2Bs and expertise exchanges just between the MobiGoIn Network companies and clusters, and the next day the companies took part of the Imagine Mobility Meetings, a wider event organised by Mov’eo. The day started with a welcome speech by Marc Charlet, General Manager, Mov’eo. This was followed by the presentation of the agenda, the objectives of the events and the next steps for the project. Then, a presentation was held by by Xavier Wartelle, CEO, French Tech Hub, about the final tips to prepare for the B2Bs and meetings with US companies and potential partners. After the presentations, it was time for the companies to get to know one another and to gain some understanding of each others’ businesses. Each SME had 1 minute to present their solution/product/competences in the form of a pitch. After all the pitches, the matchmaking began. During the preparatory phase of the event, all the companies had the chance to request who they wanted to meet, so that the MobiGoIn-Action project team could matchmake all the companies according to their expressed wishes and different areas of expertise. In order to share knowledge and explore potential collaborations, each company had at least 6 meetings during the afternoon, representants from the Canadian Embassy and Investors from USA also took part of the B2B session. The evening continued with more fruitful conversations between the companies, where many of them found new ways of working in the future – both on their own and together. More than 100 B2Bs were held during the afternoon. These were some decidedly interesting first meetings. Although there were some apparent cultural differences, everyone had at least two things in common: they worked in smart mobility in one way or another and they wanted to make the transportation a little bit easier, sustainable and smarter. During Day 2, the MobiGoIn Network took part in the Imagine Mobility Meetings, organised by Mov’eo in partnership with Ravi and Paris Region Entreprises. Imagine Mobility Meeting is a smart mobility event focused on automotive and smart mobility, including tech meetings, B2B business meetings, startup exhibitions and workshops. Over 200 companies participated to explore new business relations and to get more knowledge in the automotive business. The morning started with a workshop about autonomous vehicles (AV), smart cities and internationalisation. The first speaker, Ross McKenzie, Managing Director at Waterloo Centre for Automotive Research (Ontario, Canada), held a lecture about what the autonomous vehicle market looks like in Canada and the main challenges and opportunities are being tackled regarding the future. The second speaker, Zhilin Sim, Singapore E.D.B representative & Abdelkrim Doufène, Head of Autonomous Transport department at SystemX, continued with a lecture on the development of autonomous vehicles and the ongoing technical steps that Singapore is taking in order to have an AV roll-out in the country. The presentation presented testbeds and opportunities of how autonomous driving solutions will possibly look like in Singapore in the future, with special regards to their underground plans for the city, where the challenge is to achieve the highest possible public shared and active transport system without increasing land coverage. To understand the future of the smart mobility industry and city developments on a deeper level, a European panel discussion took place together with the Torino Wireless (ICT and Smart Cities Cluster, Coordinator of MobiGoIn-Action and partner of the SUMPs-Up project), Navya a French company specialized in the design and construction of autonomous and electric vehicles, Transdev a major French operator and global integrator of mobility, and with Wolfgang Fischer, vice- president of e-mobil BW as the moderator of the discussion. They all discussed the gains and pains within the mobility market, the opportunities with smart cities, but also the changes we’re heading towards with autonomous cars and human behavior. Throughout the discussion, the participants could get three different perspectives from the speakers, including what they saw as potential problems for companies and governments regarding autonomous vehicles, Mobility as a Service and Smart Cities. During the afternoon, the companies engaged in B2B meetings. the MobiGoIn Network companies had the chance to meet European partners form different companies, policy makers and other public and private stakeholders on the mobility and automotive fields, opening up opportunities and potential collaborations on new markets, accessing to new business contacts.